I need to lose a stone! How many times have you heard someone say that, or maybe you have said it yourself. But what you really mean is, you want to drop a clothing size, change a specific body measurement or improve your overall feeling towards the person staring back at you in the mirror. Now I’m not saying weight on the scales isn’t important, far from it. If you are a combat athlete trying to maintain a fight weight or have been told by your doctor to achieve a certain weight to improve your BMI then by all means, chase that number. However, if you are one of the many people who regularly turn up to the gym and simply want to feel better about the way they look, then I would like to suggest a different way of tracking and achieving this. Most Coaches, Personal Trainers etc. will advise you to simply decrease your calories so you are working within a “calorie deficit”. Now this will 100% ensure weight loss occurs and I am still stressing that being in a deficit is the MOST important factor, however, depending on what and how much you are eating, this weight may be water, fat or even muscle mass! Now I am speaking very broadly here so I apologise if this isn’t you, but most of the people I speak to in the gym want to ‘lose some fat and tone up’. This “toned” look cannot be achieved without a degree of muscle mass and if we are only tracking weight on the scales how can you be sure you are maintaining muscle whilst losing body fat? 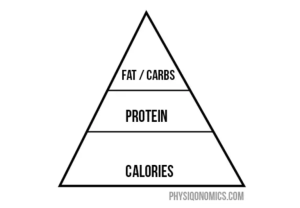 If I am saying calories are the most important factor, which I most definitely am, then coming in at a very close second is your protein consumption. Not only will a higher protein consumption help keep you feeling fuller (protein does that), but it will help your body hold onto its muscle mass whilst you are in a calorie deficit (good thing). When we are in a calorie deficit your body uses its own stored energy as a fuel source but we do not want your body using muscle as a fuel source (bad thing). This does not mean you must rush out, buy 100 chicken breasts, 5kg of protein powder and a small cow’s worth of beef every week. For starters, simply take your current body weight in pounds and multiply it by 0.6. This will give you your daily protein goal in grams. Oh, please let me add this, if you are already quite lean but looking to trim a little off the sides then multiplying by 1 works better . Simples. But (INSERT FRIENDS NAME HERE) stopped eating carbs and lost loads! Now I am not going to spend too long on this but I thought it prudent to mention, as I get told this on most days when speaking to people about their nutrition. They reduced their calorie deficit. This is all they did. Let me paint you this picture. If your friend was consuming around 1500 calories per day and then decided to stop eating bread, then this is what happened. There are 4 calories in 1 gram of carbs, now bread is not 100% carbs. I am aware of this but I am being very basic here. If your friend consumed 4 slices of bread a day at 15g per slice, then simply cutting this out would mean they are now consuming 240 calories less per day (4 x 15 = 240). This would add up over the course of 6 months and most probably would equate to a decent weight loss. I am not even mentioning the bodily water loss due to not eating carbohydrates but this would also factor in and we will explore this in my next blog post. However, if your friend did not keep their protein high enough then they would also lose muscle and end up with a higher level of body fat (oh no). Try not to be obsessed with the number on the scales, if you are not trying to be light heavyweight champion of the world it really isn’t that important. What is more important is how you feel. If you want target markers then use body measurements, clothes sizes or see a fitness coach and have your body fat measured with callipers or even better, use invasive measuring tools such as the Boditrax machine. From here you can easily see your body fat reducing and ensure you are keeping your muscle mass. Which will ultimately make you feel better and make sure you achieve your physical goals. Keep your calories in check, eat plenty of protein, don’t be scared of carbohydrates, eat your veggies and ultimately have fun with your exercising. You are so much more than a number on the scales, be happy in your own skin and if you need help the coaches of Life Leisure are always here for you.